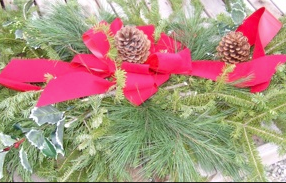 Wander a cemetery during the winter and you may come across an arrangement of greenery decorated with pine cones and ribbons lying upon a grave. This is called a grave blanket or a cemetery blanket. The tradition of placing grave blankets upon graves began in the upper Midwest, brought here by the Scandinavians. 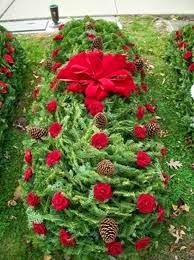 During November or December, Midwestern settlers would go out into the woods and gather pine branches to place over a loved one’s grave. 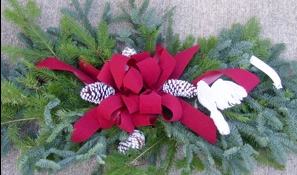 Today grave blankets are sold mainly around the holidays at florists and various retail stores. The “blankets” come in a variety of sizes and shapes; some are adorned with silk flowers or baby’s breathe scattered among the boughs, others trail ribbons and bows. 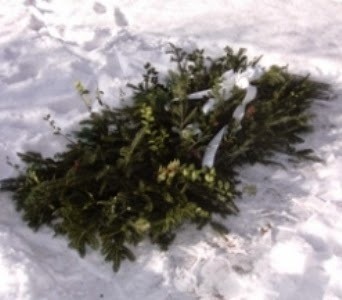 A grave blanket is usually placed upon a grave around Thanksgiving or Christmas when all foliage is gone; the blanket provides color and decoration during the cold, barren winter months. The placing of a grave blanket is considered personal; therefore family members are usually the ones to lay a cemetery blanket upon a loved one’s grave. 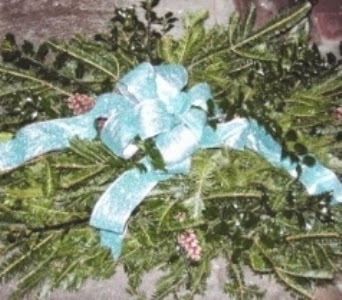 A smaller version of the cemetery blanket is also made and is known as a grave pillow, which is placed up near the headstone. Most grave blankets can be found in the colder sections of the country, including Minnesota, Michigan, Illinois and Iowa. Cemeteries will remove most grave blankets during the month of March, allowing for the arrival of spring and a new growing season.